I´m using the Listgroup BootStrap, ok, easy ! I assume you mean at runtime. Use the .addItem function. Its first argument is HTML, so you can include an HTML image element. Will give the correct effect ? How can anyone help if you don’t say what the error is? Can you answer my other question as well? Please help us answer you - it’s a waste of everyone’s time if you don’t give the information. This is the problem, I don´t know whats is line 01 ? i just want to show a image in each one of the items, the docs says taht it can be a html code, i done it, it´s show the resulkt, but when i click to select a item, give me this error ! The JqWidgets ListBox do this stuff ok, but don´t have a “onselect” or “onclick” event example for how to manage the situation of item selection ! The event only uses a second button to do the selection, I don´t wanna this, I need that if the user select a row , do a stuff ! Ok, sorry for any incovenience ! I used the BootStrap ListBox, and in the docs/wiki says that i can use html code for the each one item in teh list, ok, I done it, and when execute teh app it show ok the html stuff. 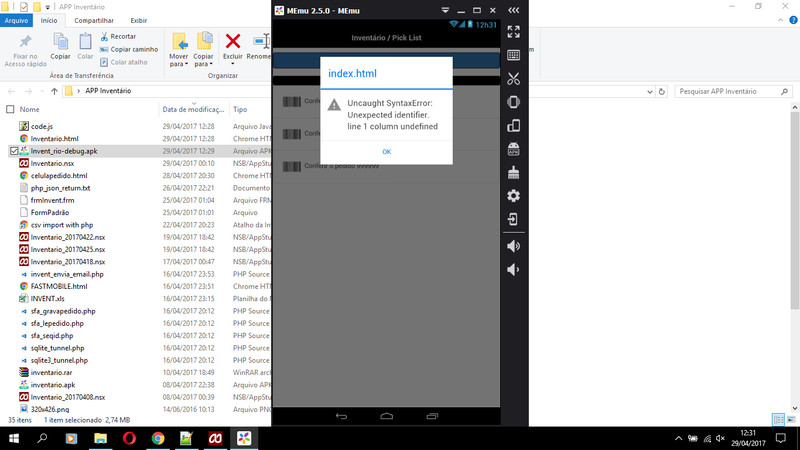 But when I click in the item it give me that error, in index.html, line 1 that is exactly, i think, the line one of the .html with the name of my app. To comparison, I´ve done the same stuff using the jqwidgets listbox, used the same code, but using the renderer of the jqxlistbox, and then, the same result visually, but working fine. Thank you for the response and patience !